Devin is home for a nice stretch so we decided to visit a museum nearby. The Tellus Science Museum in Cartersville, GA.
We pass this place when drive to Atlanta and I had always wondered what was inside. I decided that a visit was in order! Yesterday's family field trip proved that this is a rather fun museum. Excuse the blurry pictures, but it wasn't until we left that I saw my lens was on the wrong setting for indoors. At any rate, we were able to see some wonderful dinosaur models. We also got to see real fossils from the era. There was another exhibit with minerals and gems that the boys especially loved. Those kids love rocks. There was a model of a mammoth skeleton that I especially liked. It's cool to see how large the things were up close. There was also an exhibit with old cars and space shuttles. We even saw a display to scale of the Kitty Hawk. Looking inside a real Mig fighter jet showed us how many switches and gears those jets use! I honestly don't know how pilots fit in such small spaces or learn everything on the jets. 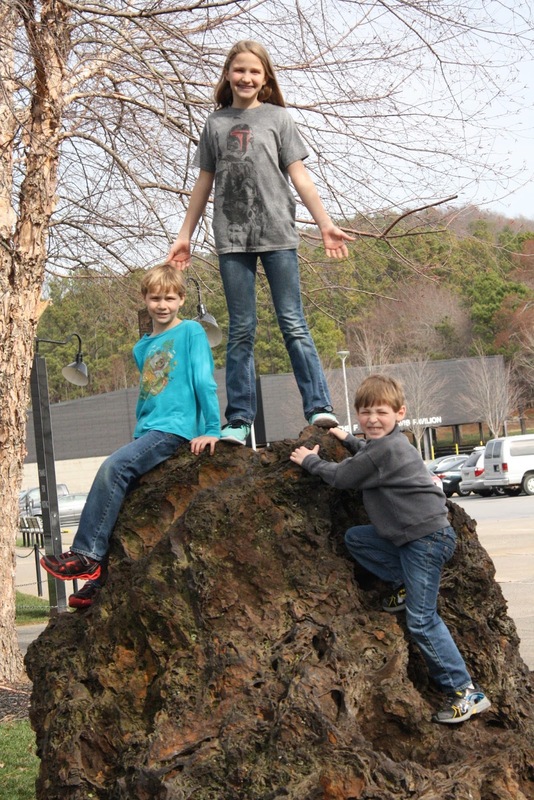 Of course there were some awesome rock specimens outside available for climbing and photo taking too. It gave us some fresh air before going back inside for a planetarium show. The kid also got to pan for gem stones (pretty rocks) as part of the ticket price. They each came home with a small bag of treasures. They also came home with shark teeth that they dug from the archeology dig exhibit. We missed Quinn. She had to work and missed out on the trip. We brought her a gift from the gift shop though. After the fun day, we stopped at Steak and Shake for dinner, something we rarely do with this large family. I bought a year pass, so I plan to go back throughout the year. They are building a solar house for display, and they also have an observatory for use on certain nights. We did take a couple pictures of me and the baby, so we have proof we were there too...and I brought home a shark too as well :-)!! This was a fun school day and a short break from farm life!